Normally two examinations are conducted by the college in one academic session besides the CHSE/University Examinations. Pre – Test - during the month of September – October. Test - during the month of December . Half – yearly – during the December. Promotion Test – during the month of April. The exact date, programme, duration, full marks ect. Will be notified 15 days before the commencement of each examination. Willful absence from the examination shall make a student liable for fine or detention. However, the principal can grant exemption subject to the condition that she will appear the re-examination at a later date by depositing the requisite fee for it. Malpractice and misconduct in the examination will be punished with fine/exclusion/detention as deemed fit. In order to get promotion to the next higher class or to be declared sent up in the Test Examination, a student should have 75 % of class attendance and should clear all dues payable to the college in adition to satisfactory performance in the examination. The council of Higher Secondary Education. Orissa conducts two examinations every year for +2 students as per new syllabus. Annual examination commence from a date during the 1 st week of March or as notified by the council. Instant Examination, Which is held immediately after the declaration of the result of Annual Examination, failed candidates who have secured,pass mark in aggregate are aligible to appear the Instant Examination in the failed subject. The course structure and distribution of marks for Science students will be as Follows. Besides the sbove mentioned two elective subject a students shal have to offer two elective subject out of the following group as 3rd and 4th elective. Either group ‘A’ or group ‘B’ / for 3rd and 4th elective. N.B : Environmental Education will be assessed in the college level for 100 marks (70 marks for theory and 30 marks for project work). The Grades in Environmental Education are to be awarded by the college as per the following. Each practical subject of 100 marks is divided into 70 marks for the theory and 30 marks for practical. Each elective subject carries 200 marks (100 marks in 1 st year and 100 marks in 1 nd year). Each practical subject of 100 marks is divided into 70 marks in theory and 30 marks in practical. 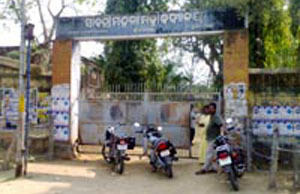 As per the new pattern of Examination introduced by the Berhampur university, a candidate has to appear and pass three university Examinations in three years in order to get the Bachelor Degree from the University . First University Examination at the end of 1 st year . Second University Examination at the end of 2nd year. Final University Examination at the end of 3 rd year .